If you are seeking for cheap and good food around the central region of Malaysia, you should not miss out this simple and yet fulfilling food stall located within Rawang, Selangor, Malaysia. 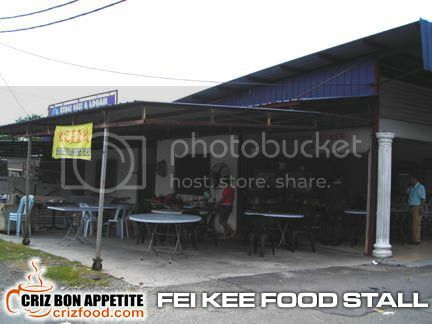 Goes by the name of Gerai Makan Fei Kee, this little corner lot food stall is just at the main road of Jalan Batu 18, leading to Kampung Dato’ Lee Kim Sai. Although quite secluded within the housing estate, their unique and down to earth dishes have not stop people from all walks of life to frequent their stall. The husband and wife team, Lau Lian Kee and Lai Tsuey Ngoh, started this food business a few years back. Their signature dish which comprises of steam freshwater fish head had attracted many people due to its freshness, non-muddy taste and lastly its cheap pricing. Instead of the usage of Tilapia (非洲魚) as served by many restaurants within the KL/Selangor regions, they used another fish species known as the Chinese Carp (Tongsan/Song Yu). 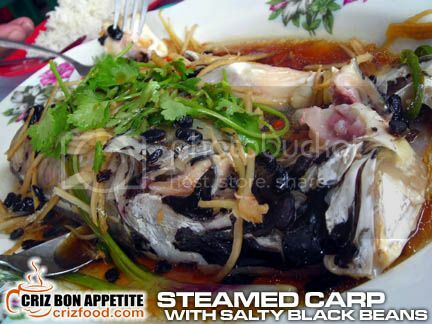 Thus, you have their signature Steamed Carp with Salted Black Beans (RM20 for a 10” long fish head). I have a phobia in taking muddy-taste fish but this dish turned out to be fine. Mr. Lau sure knows how to get rid of the earthy smell in the flesh. The dish had some salted black beans (douchi/豆豉), lots of ginger strips, sliced red chilies, mildly sprinkled with some quality soy sauce and shaoxing wine, followed with chopped coriander and spring onions as garnishing. 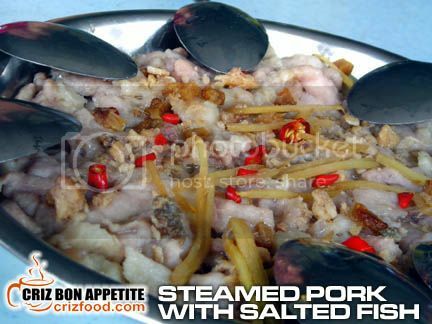 Another of the home cooked dishes that I like was their Steamed Pork with Salted Fish (RM16). The balance in the fatty and lean parts of the pork slices, mildly marinated in some pepper, soy sauce and corn starch, mixed with some quality salt fish slices and topped with some ginger strips and red chilies did impress me. Each bite just melted into my mouth. It was delicious indeed. With such a big fish head and a pork dish, we needed some vegetables. We tried out their Fried Sambal Belacan Kangkung (RM9). 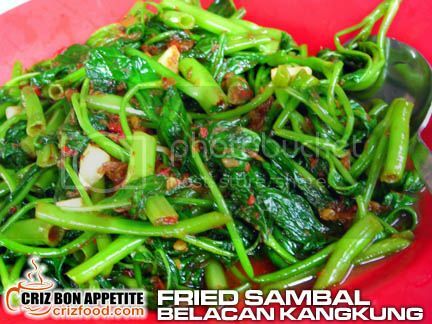 The kangkung (water spinach/water morning glory/空心菜) were young and crunchy. The sambal belacan had the right combination of pounded chilies and toasted shrimp paste and it was not too spicy for us. I found some dried shrimps being used in this dish too. It was a refreshing dish for us. 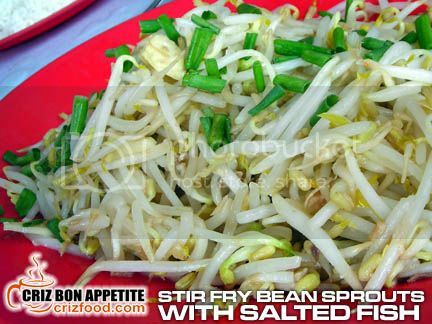 We also had some Stir Fry Bean Sprouts with Salted Fish (RM9). I found this dish to be a bit pricey since bean sprouts were supposed to be dirt cheap but I’m not complaining. The bean sprouts were stir fried just right while maintaining their crunchiness and the usage of deep fried salted fish was just right. 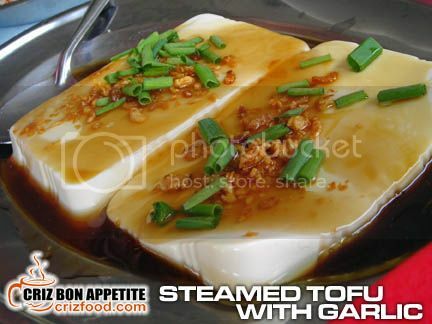 On top of the above dishes, we also did order the Steamed Tofu with Garlic (RM5). It was just one of those boxed tofu you can get easily at the supermarket. I could easily cook that at home with the exact amount of fried chopped garlic, soy sauce and chopped spring onion garnishing but I was again fooled by the chef as there were some deep fried dried shrimps added too. This was another of those simple and yet delicious dish to go with our rice. Overall, the total bill came out to RM70 for the 6 of us, excluding the special tea leaves we brought in for our beverages. I expected the meal to hit the RM100 mark for such a big fish head and dining in the central region where the cost of living is higher but it ended up so cheap. Unbelievable! No wonder The StarMetro and Dong Fan Ri Bao (東方日報) wrote about them in 2009 and 2008 respectively. For those without a GPS or are not familiar with the Rawang area, you might get lost. But no worries, you could always ask those around the area how to get to Kampung Dato’ Lee Kim Sai. From there it would be real easy to find the food stall. If you are using the North-South Highway, turn into the Rawang Interchange. Drive all the way until a T-junction and turn right into Jalan Bakar Arang. Drive on all the way passed Jalan Ciku (right) and Jalan Kuala Garing (left) until you see a sign leading to Stesen KTM Rawang. Ignore that and drive straight until you see a cross junction below a flyover. Turn right into Jalan Rawang and take the first right turn into Jalan Batu 18. The food stall is just on the right, diagonally opposite Jalan Batu 18/3 (leading to Kampung Dato’ Lee Kim Sai). You can see a big Hino signboard at the left corner shop lot of the small lane and Poh Huat Auto Air Cond Service/Yik Lee Motor at the right side. No. 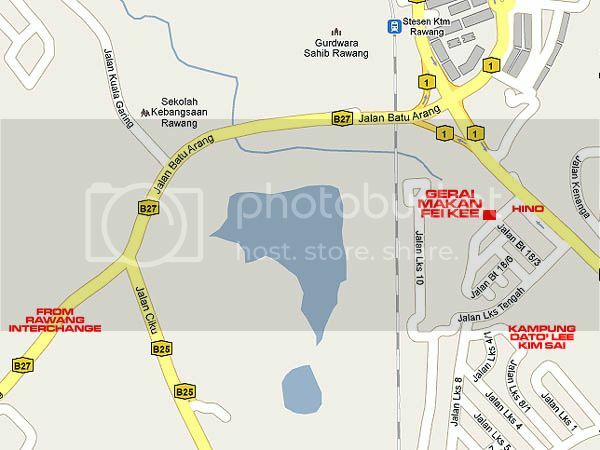 1C, Batu 18, Jalan Besar Rawang/Ipoh, 48000 Rawang, Selangor, West Malaysia. Nx time you must take me there!! What fish place? It sounded like a nice place for some wild catches for my dining table.. haha!